Patches of vegetation poke through a snow-covered island on Gold Creek Pond, located in Kittitas County, Washington. During the 1970s, the pond and surrounding areas were one large gravel pit, which construction workers used in building the nearby Interstate 90 highway. The site was cleaned up in the early 1980s, revealing a picturesque mountain pond that is now surrounded by a popular hiking loop. The Aral Sea was an endoheic lake (one with no outflow) located between Kazakhstan and Uzbekistan. Once the fourth largest lake in the world with an area of 26,300 square miles (68,000 sq. km), it has been shrinking since the 1960s after rivers that fed it were diverted by Soviet irrigation projects. By 1997, it had declined to 10% of its original size and split into four lakes, one of which has since disappeared. The shrinking of the Aral Sea has been called one of the planet's worst environmental disasters. The Oosterscheldekering (Eastern Scheldt storm surge barrier) is the largest in a series of 13 dams designed to protect the Netherlands from North Sea flooding. It spans about 5.6 miles (9 km) between the islands of Schouwen-Duiveland and Noord-Beveland, containing large sluicegate-type doors that can be closed under adverse weather conditions. Designed to last more than 200 years, the Oosterscheldekering is sometimes referred to as the eighth Wonder of the World. This Overview shows part of the Dorsoduro sestiere in Venice, Italy. A sestiere — which comes from the Italian “sesto,” meaning sixth — is a subdivision of an Italian town or city divided into six districts. Dorsoduro is Venice’s university district and is filled with bars, restaurants, indie shops, vintage fashion boutiques and art galleries, such as the Peggy Guggenheim Collection. A steep 418 steps lead to the top of Mount Aksla in Ålesund, Norway. At the summit is the Fjellstua Viewpoint, which offers panoramic views of the city below, as well as the surrounding archipelago and Sunnmøre Alps. Despite being one of Norway’s smallest municipalities by area — at 38 square miles (99 sq. km) — Ålesund is the country’s 17th most populous city, with about 47,200 residents. Wildflowers blanket the hills around Lake Elsinore, a city in southern California. This explosion of poppies and other blossoms — called a "super bloom" — occurs when a rainy fall and winter are followed by cold temperatures that lock moisture in the ground. This year's super bloom is southern California's biggest in years, which has attracted droves of locals and tourists to the hills. Cape Town is a port city on South Africa’s southwest coast. The city’s geography is influenced by the surrounding Table Mountain, the Durbanville Hills, and the expansive lowland region known as the Cape Flats. These geographic features divide the city into several commonly known suburbs, many of which developed simultaneously and share common attributes of language and culture. This unique blend has made Cape Town one of the most multicultural cities in the world, attracting tourists, immigrants, and expats to South Africa. A ship full of containerized cargo navigates San Francisco Bay, located between San Francisco and Oakland, California. Due to San Francisco's limited real estate, Oakland has served as the primary Bay Area port since the 1960s. The Port of San Francisco handled no containerized cargo in 2017, whereas the Port of Oakland had a throughput of nearly 2.5 million twenty-foot equivalent units (TEUs) that year. Primošten is a town in southern Croatia, located between the cities of Šibenik and Trogir on the Adriatic coast. It is made up of two peninsulas — the Primošten peninsula (shown here) and the Raduča peninsula — as well as mainland areas. Primošten is famous for its large, beautiful vineyards, which are being considered to become a UNESCO World Heritage site. Trailers are docked and loaded at the Chicago Area Consolidation Hub, a package sorting facility in Hodgkins, Illinois. This 1.5 million square foot (139,355 sq. m) facility is owned by the United Parcel Service (UPS) and handles packages traveling throughout the United States and world. Roughly 1.5 million packages pass through its more than 65 miles (105 km) of conveyor belts every day. Uniform apartment buildings are seen here at Cypress Village, a township in Irvine, California. As a master-planned city, Irvine contains dozens of communities like this — each one having houses of a similar design, along with commercial centers, religious institutions, and schools. Irvine is one of the wealthiest cities in the western United States, with a median household income of $90,743 and a median home value of $784,500. Cape Cod is a hook-shaped peninsula that extends into the Atlantic Ocean off southeastern Massachusetts, USA. The 15 towns on the cape are a popular summer destination with quaint villages, seafood shacks, lighthouses, and many beaches. The three towns at the northernmost tip of the cape — Wellfleet, Truro, and Provincetown — are visible in this Overview. WATCH: These jaw-dropping juxtaposes shows farmland at the Nebraska-Iowa border before and after catastrophic flooding occurred there last week. Floods across the Missouri River Basin were caused by heavy rainfall and rapid snowmelt, and the total cost of damages in Nebraska has exceeded $1.3 billion. At least 2,000 homes and 340 businesses have been damaged or destroyed, and losses to infrastructure, farmland and livestock are monumental. 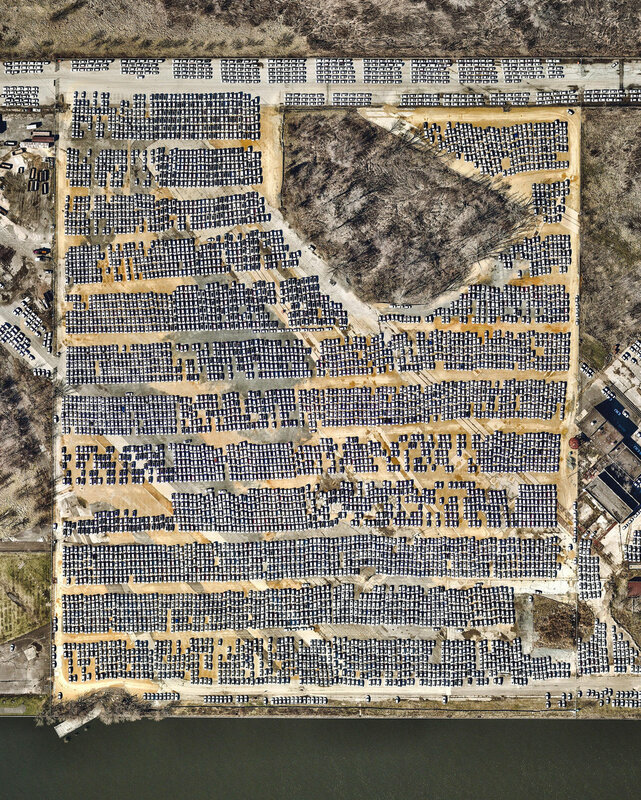 Thousands of automobiles fill a large lot near the Philadelphia Navy Yard in southern Philadelphia, Pennsylvania. Since 2010, when Hyundai and Kia Motors moved their import businesses to the city, several large lots like this have popped up to accommodate an influx of new vehicles. At least 120,000 vehicles a year have arrived at the Port of Philadelphia since 2011, and more than 155,000 were delivered in 2015. Check out this awesome view of Sydney, Australia, taken from the window of a passenger jet leaving the city. Sydney covers a 4,775 square-mile (12,367-sq.-km) area and boasts roughly 2.5 million acres (1 million hectares) of nature reserves and parks. From this perspective, we can see many of the city's landmarks, including the Sydney Harbour Bridge, Sydney Opera House, Royal Botanic Gardens, Sydney Observatory, and others. Massive oil tankers are dwarfed by the Adriatic Sea just outside the Port of Venice, Italy. Last year, 26.4 million tons of freight passed through the port — an increase of more than 1 million tons from 2017. Of this, at least 7.7 million tons was refined petroleum products, and much of the rest was dry bulk goods and containerized cargo. Lake Mead — located on the Colorado River 24 miles (38 km) southeast of Las Vegas, Nevada — is the largest reservoir in the United States. The lake was formed with the creation of the Hoover Dam in the 1930s. Due to a combination of drought and increased water demand in the surrounding states (specifically California, Nevada, New Mexico, and Arizona) the lake’s water level has been lowering drastically in recent years. This decreasing water level exposes the white shoreline that is visible in this Overview. Check out this aerial view of Bologna, Italy, taken atop Asinelli Tower. This tower was constructed between 1109 and 1119 and is the most prominent of the medieval “Towers of Bologna,” at 319 feet (97.2 m) tall. Its companion tower, the Garisenda, can be seen at the center of the courtyard and is roughly 157 feet (48 m) tall. Dallas/Fort Worth International Airport covers more than 27 square miles (70 sq. km) in Texas — an area larger than the island of Manhattan. It is the fourth busiest airport in the world by aircraft movements and the 14th busiest in the world in terms of passenger traffic, handling 69.1 million travelers in 2018. A hot-air balloon floats above Cappadocia, a historical region in Central Anatolia, Turkey. This semi-arid area is known for its distinctive "fairy chimneys" — tall, cone-shaped rock formations clustered across the landscape. 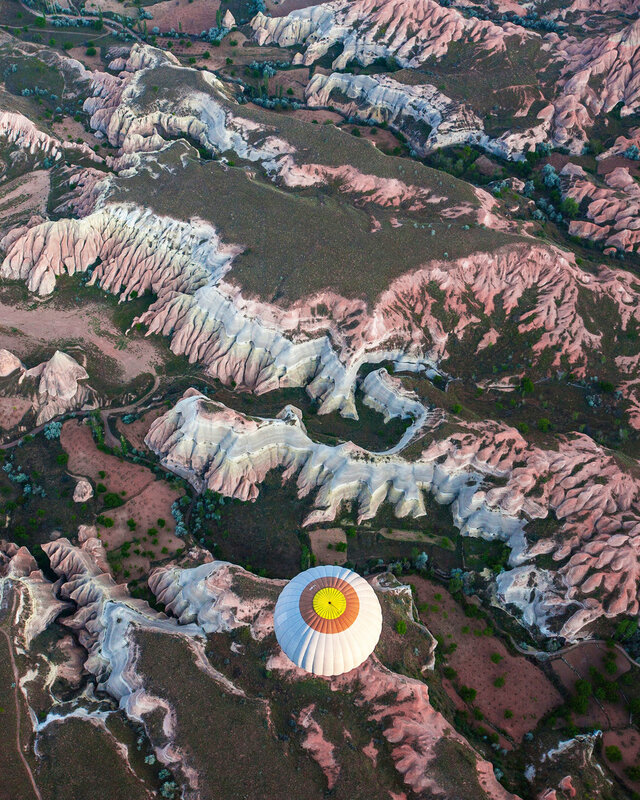 Hot-air ballooning is very popular in Cappadocia and is available to tourists in Göreme, a local town.